Acer is fully aware of the potential impact our products may have on the environment. Hence, our product design takes into consideration the ways to reduce environmental loading from the outset of production, in addition to user needs, functionality and added value. Based on the life cycle concept, we offer high-quality products that are energy and resource efficient, low in pollutants and hazardous substances, and easy to recycle. By employing green purchasing and communications with our suppliers we have been able to establish a green supply chain that is thoroughly in line with international environmental practice. We carefully consider environmental factors in every stage of the product life cycle. This includes selecting materials during design, through packaging and shipping, to usage and recycling. We hope to work with consumers to reduce environmental impact. 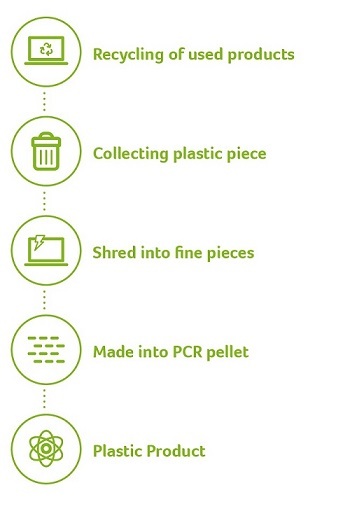 Acer supports the concept of resource recycling, and as such we actively strive to use post-consumer recycled plastics (PCR) in our products. At the same time, with regard to the materials that are most likely to create problems of pollution or occupational safety in the recycling process, we work with plastics manufacturers and upstream recyclers to conform to international standards of quality, environmental safety, occupational health and safety, and standards of Responsible Recycling (R2), earning international export licenses and recycling service provision qualifications from local governments. When deciding on machinery and proportion of PCR during the planning of products, we are careful in our selection of suppliers; for new products using post-consumer recycled plastics, we strive to stay as close as possible to the physical properties of our materials during formulation; in the design process, we focus on improving strength and reliability, and in product testing we have added stronger tests of strength, reliability, and lifespan to ensure product quality. This means that users can not only enjoy products made of quality recycled plastics, but also join Acer in supporting the use of reused or recycled materials. From 2013 through 2016, Acer continued to expand our usage of recycled plastics in our displays and all-in-one models, and we are committed to ongoing efforts to further increase the percentage of such usage, and to the increased usage of PCRs. For example, in 2016, we used near 2,000 metric tons of PCR within our below product. There are 100% commercial display models already use the PCR as the component and these models contribute more than 40 % for annual display shipment totally. In 2017, we continued to use recycled plastics in display units and all-in-one computers, including the B6 and V6 lines of displays and the all-in-one VZ4640G, VZ4820G, and VZ6820G models. From 2018 onwards, we expect to introduce more models and accessories that use post-consumer recycled plastics, and more to create more circular economies. Acer is strongly committed to the protection of human health and the conservation of the environment. As to uphold the spirit of the precautionary principle, we abide by all regulatory standards concerning particular chemical substances and demand our suppliers to follow the “Guidance of Restricted Substances in Products” established by Acer to ban or restrict to use chemical substances. Acer strictly forbids continued use of substances that have been confirmed by authorized appraisal agencies to cause irreversible damage to the ecosystem or human health. If current scientific technology is unable to confirm certain substances to cause irreversible effects, Acer proactively assesses whether it should continue using such substances. Until a safer, more suitable substance is made available in the future, Acer will continue to use the substitute. In the meantime, Acer will actively research and develop safer and more suitable substitutes. In the case of a dispute, Acer takes responsibility by proactively gathering and providing related proof. Since the European Union’s (EU) promulgation of the RoHS directive, Acer has established environmental safety teams at Acer’s headquarters in Taiwan. The primary tasks of this organization are to stay abreast of related regulations and information in each EU nation. This team is responsible for providing guidance, inventorying raw materials used in manufacture, switching to alternative materials, and verifying their effectiveness for each product line and each supplier of principal components. Since 1st July, 2006, all of Acer’s products have been RoHS compliant globally. For recast of RoHS in 2010, Acer has supported the proposal of organo-Cl/Br-free RoHS version, but it has not been adopted. Acer will keep watching the development of future recast to have early involvement of new materials and work on relevant strategies in time. In 2011, RoHS recast (RoHS 2) Directive 2011/65/EU is announced on 8th June, which enlarges the product scope and introduces the conformity process in harmonization with CE marking methodology. Acer updates related management process in each product line during the transportation period, and since 3rd January 2013, all of Acer’s products have been RoHS 2 compliant globally. In 2015, EU commission has published a new Directive (EU) 2015/863 to amend Annex II to EU RoHS 2 (Directive 2011/65/EU) to add 4 phthalates (DEHP, BBP, DBP and DIBP) onto the list of restricted substances and will be restricted from 22 July 2019. Acer has started to communicated with supply chain in the end of 2017 to insure the compliance of the requirements. REACH (which stands for Registration, Evaluation, Authorization, and Restriction of Chemicals) is the name for the European Union’s recent chemicals policy, contained in Regulation (EC) 1907/2006 which entered into force on June 1, 2007 (REACH Regulation). REACH places greater responsibility on industry to manage the risks that chemicals may pose to human health and the environment. Under the regulation, certain chemical substances, either by themselves, in compositions or in articles may not be manufactured or placed on the market within the European Union unless they have been registered in accordance with the relevant provisions where this is required. The REACH Regulation is based on the principle that it is for manufacturers, importers and downstream users to ensure that they manufacture, place on the market or, respectively, use such substances that do not adversely affect human health or the environment. Its provisions are underpinned by the precautionary principle which is consistent with Acer’s concept for chemical substances management. the substance is intended to be released under normal or reasonably foreseeable conditions of use. Through preliminary assessment and expert consultation it has been determined that our products do not release the substances under normal or reasonably foreseeable conditions of use. Therefore, Acer will not submit a registration to ECHA. the substance is present in those articles above a concentration of 0,1 % weight by weight (w/w). On October 28, 2008, ECHA first listed 15 substances in the Candidate List of Substances of Very High Concern for authorization. The list of substances is updated regularly on ECHA's website. Substances that are included in the Candidate List have been identified as Substances of Very High Concern (SVHC). These substances may have very serious and often irreversible effects on human health and the environment. Substances on the Candidate List may subsequently become subject to authorization by decision of the European Commission. Acer keeps close attention on the new development of the SVHCs and the Authorization List. ECHA recommended that seven chemical substances of very high concern should not be used without specific authorization on June 1, 2009, The list of substances is updated regularly on ECHA's website. Those listed substances may not be used within 42 to 48 months after the inclusion date. Acer will monitor further developments to provide necessary implementation measures with suppliers. Once substances are included in the "Authorization List," Acer will view them as restricted substances from such moment on and request suppliers to analyze the availability of alternatives and consider their risks, and the technical and economic feasibility of their substitution. For more information about REACH Authorisation List, please visit ECHA. Based on Acer's proactive attitude for environmental protection, Acer manages hazardous substances beyond RoHS compliance and develops HSF management schemes following the precautionary principle. To fulfill such principle, we conducted a full inventory together with suppliers for SVHCs and disclose SVHCs over 0.1% (w/w) contained in acer products as below. Acer will keep working with supply chain to seek out any SVHCs contained in our products, and those containing more than 0.1% will be updated onto our website information accordingly. *Above listed substance(s) do not pose a safety risk to customers. 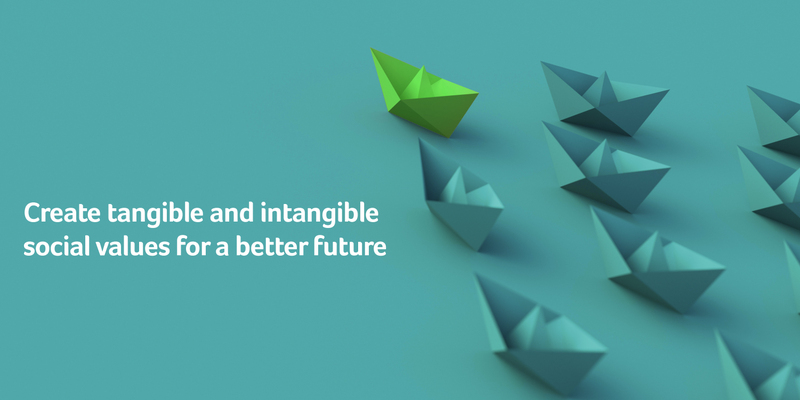 We believe that the green product design should contain three key elements – materials, energy and recycling – to develop product with life cycle thinking. Therefore, we work in coordination with international mandates, stakeholders and customers to conduct environmentally friendly designs and maximize eco-effectiveness. Based on the precautionary principle and the Individual Producer Responsibility (IPR), we have started the first phase of the Hazardous Substance Free (HSF) plan for PVC, BFR and phthalates to alleviate the hazardous problems of waste electronics in recycling stage globally. The key factors for alternative substances is that they must not detrimentally influence new product quality, safety, reliability, and they must not endanger human health or pose worse environmental impacts. We are striving to reach the target of prohibiting the use of PVC (polyvinyl chloride), BFRs (brominated flame retardants) in all newly personal and mobile computing products by working with partners and suppliers. Since its inception from 2005, the HSF Plan has completed a number of programs. After HSF pilot runs for many products, most technical problems have been solved; therefore, many HSF products (with BFRs-free PWBs and casings) have been produced and launched to the market. When technologies were ready for a total phasing in of PVC/ BFRs-free models in 2009, most key component suppliers delayed because the market and the other major brand companies extended their schedule for phasing in, the suppliers would not phase in without additional cost. This change was far beyond our expectation and interrupted Acer’s commitments to phase in PVC/ BFRs-free products. 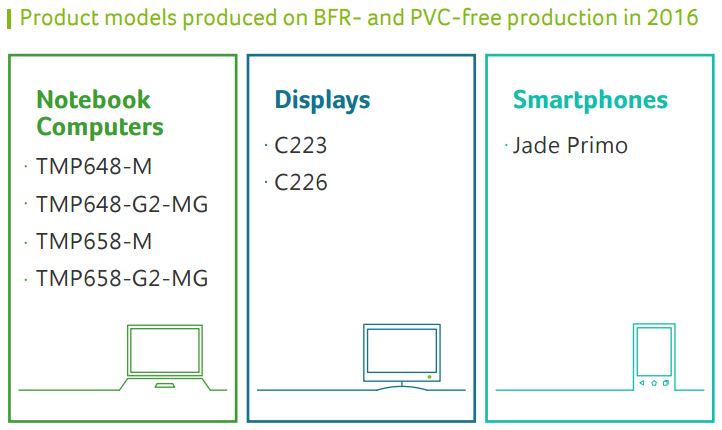 Nevertheless, Acer is still trying to increase PVC/BFRs-free products within business tolerance. As such, Acer hopes that influential regulations can help to restrict PVC/BFRs; the EU directive RoHS might be the most important one. Regulations to prohibit halogen containing products are now critical. If such a regulation can be predicted, the supply chain and the market will go for non-halogen products before the effective date of regulation. This is the quick solution for widely accepted halogen-free products and for the problem that Acer encountered. To aggressively support organo-Cl/Br-free version of RoHS 2.0 revision, Acer attended the Symposium on Global ICT Environmental Initiatives held by Intel and iNEMI in Brussels on October 27-28, 2009. In November 2009, Acer visited Brussels to attend the meeting of organo-Cl/Br-free RoHS version 2.0 and conference of Greening Consumer Electronics-from Hazardous Material to Sustainable Solution. In April 2010, Acer again visited Brussels to attend a meeting with the Committee on the Environment, Public Health and Food Safety, in concern with the development of organo-Cl/Br-free RoHS version 2.0. We discussed Acer’s determination to support the organo-Cl/Br-free RoHS version with key EU personnel during the visits. In May 2010, Acer and e nvironmental organizations sent position statements to MEPs and members of the Council of the EU, urging them to restrict more hazardous substances in electronic products in 2015 to avoid more global dioxin formation. Acer will keep evaluating the possibility to join other meetings or groups to support the organo-Cl/Br free RoHS. In order to comply with regulatory requirements and customer standards, Acer integrates environmental and safety-related standards into the product R&D stage, and through rigorous review processes, ensures that the production processes of suppliers are also in line with environmental and safety requirements. And to help users fully understand the safe use of Acer products and how to properly recycle them, Acer includes explanations in product manuals and provides them for download on the company’s official website. To protect the health and safety of users and reduce potential environmental risks, Acer strives for prudence in its management of chemicals in materials. In addition to adhering to regulatory restrictions on the use of chemical substances, we also proactively work to meet the needs and demands of each regional market, including those environmental certifications that focus on the limited use and traceability of substances, e.g. Taiwan Green Mark, China Environmental Labeling, the Electronic Product Environmental Assessment Tool (EPEAT), and TCO Certification. We pay close attention to international environmental law and have taken the initiative in managing chemical substances that may pose a threat to human health or the environment. Since 2009, we have continued to voluntarily promote the production of notebooks, desktops, displays, and smartphones that do not include polyvinyl chlorides (PVCs) or brominated flame retardants (BFRs), as well as continuing to move forward on dehalogenization. In 2012, we added to our product environmental safety specifications limiting the use of seven phthalates that could potentially have an impact on human health; in 2013, we added two further phthalate limits, as well as completing surveys into the use of five chemical substances - beryllium, antimony, arsenic, selenium, and bismuth - in our notebook computers. In 2015, we added further restrictions, introducing limits on the use of two more phthalates, along with sulfur and red phosphorus. In 2014, together with the Canada Gov. Gazette (Vol. 147, No. 28 - July 13, 2013), Acer completed a survey on the usage of phthalates, learning that although only a portion of phthalates are prohibited by law, there remain potential environmental risks in the usage of other phthalates. In response, Acer included “Phthalate Usage Disclosure” as a new item for assessment in the Supplier CSR Scorecard since 2014 Dec., encouraging suppliers to give priority to materials not containing phthalates and thus helping promote the de-phthalatization of our products. In 2016, we not only continued our supplier CSR scorecards, Phthalate Usage Disclosure evaluations, encouragement of all suppliers to prioritize the use of phthalate-free raw materials, and promotion of a move to phthalate-free products, but also added a new survey for the use of prohibited and restricted chemical substances in products. After collecting information on substances of concern to suppliers and to domestic and foreign stakeholders, we commenced preparation of the drafting of a table of chemical substances banned or restricted by Acer in the production processes of suppliers, further improving the non-toxicity of our production operations. The specific substance content in all future products shall confine within threshold limits. At this stage, suppliers should disclose the concentration and which parts used. Substances listed in the following table are handled based on prevention principles. They are placed on a disclosure substance list for review from which a schedule is then drawn up for phasing out their use. The execution of the schedule then proceeds with verification, technological analysis and substitute material testing according to the HSF plan. Testing is conducted to determine whether any substitute technology will influence the quality, safety and reliability of finished products as well as to determine any possible adverse effects on human health or the environment. We launched the “Sustainable Paper and Packaging Policy” in 2012 in order to enhance the sustainability of global forest ecosystems. Acer understands that deforestation will cause serious impact to the ecosystem stability and we recognize and appreciate the efforts that undertaken to protect biodiversity. Acer prohibits all business relationships with suppliers that are involved in deforestation and illegal logging. We only permit the sourcing of supplies from non-controversial sources and responsibly managed forests. Obtain raw materials from legal sources. Suppliers shall not violate forest conservation laws or being involved in illegal practices in the nations and regions where they conduct business. Maximize the use of eco-friendly paper products in all operations, including the use of recycled content, recyclable, and renewable materials with the goal of achieving a low environmental impact throughout the entire life cycle. Minimize the consumption of paper products containing virgin wood fiber. Out of a desired to cherish the resources we have available, Acer has since 2016 been planning reductions in the size of desktop product boxes and scale of packaging. In 2018, Acer expects some 40% of all desktop computer shipments to use this packaging. In 2017, approximately 60,000 desktops shipped with the reduced-volume packaging and boxes. In 2017, Acer launched all new shells and new interior structure for boxes, making more efficient use of the space and streamlining product appearance and size. These new shells boast some 40% reduction on the previous design, reducing the amount of iron, plastic, and cardboard used. The vast majority of product packaging becomes waste after it has finished its job of protecting the product(s) within. 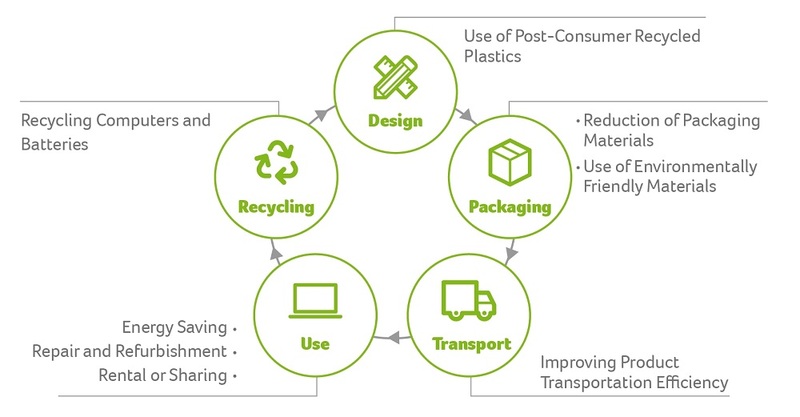 Acer carefully considers the materials we use in our packaging, with packaging design emphasizing recyclability and making use of readily recyclable materials a priority. More than 98% of our desktop PC packaging used 100% recycled pulp, minimizing the negative impact of packaging on the environment. On top of this, all of the posters included with products are produced with Forest Stewardship Council certified paper, while all printing uses environmentally friendly water-based and soy inks. Every day, tens of thousands of Acer products make their way to consumers’ hands. Acer strives to reduce the volume and weight of our packaging, thus improving transportation efficiency and reducing the fuel consumed in the course of transport. This helps further reduce the carbon emissions generated during transport, while also reducing the overall cost of that transport. We have reduced CO2 emissions through the principles outlined below. Together with our partners, we have continued to adjust our container shipping management, enabling us to handle empty container deliveries at our Chongqing production site and eliminating the 1,800-plus-kilometers of overland transportation between Shenzhen and Chongqing. In 2017, the Chongqing site directly dealt with some 3% more in empty container deliveries than in 2016, while in Q4 2017 we further optimized our logistics management, not only reducing shipping time but also improving supply chain lead time and saving approximately US$3.19 million in shipping costs. Providing environmental information about products is a responsibility that all corporations must assume. The primary objective is to keep consumers informed about environmental information regarding the products they purchase. To comply with the requirement of point 7, INFORMATION TO BE PROVIDED BY MANUFACTURERS, of Annex II of (EU) No. 617/2013, Acer provides technical documentation on free-access local website for all notebook, desktop, All-in-One PC, and tablet computer subject to the regulatory product scope for European market. As part of our commitment to energy conservation, carbon reduction and sustainability, Acer has always focused on the energy-saving design of our products. 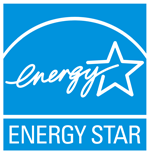 ENERGY STAR is a U.S. Environmental Protection Agency voluntary program that helps businesses and individuals save money and protect our climate through superior energy efficiency. Among ENERGY STAR specifications, those related to Acer products are computers (including laptops, desktops and all-in-one PCs) and displays. Please visit Energy Star official site to learn more and updated details for Acer products which has earned ENERGY STAR. EPEAT has divided product environmental attributes into eight major categories with 51 criteria; 23 criteria are required and the remaining 28 are optional. Products that meet all 23 required criteria would be awarded the Bronze status; products that meet all 23 required criteria and 50% of the optional criteria would be award the Silver status and those that meet all 23 required criteria along with 75% of the optional criteria would be awarded the Gold status. Please visit www.epeat.net for more details or to search for registered Acer products in each country. The problem of treating the waste of electronic and electrical products has already become among the most pressing international environmental protection issues. It is also a major environmental concern at Acer. During our product design, we strive to reduce the environmental impact of the product at each stage of its life cycle by eco-design and aiming to design environmentally friendly, easily recycled products. Through both voluntary and legally required recycling programs, we provide consumers with compliant, convenient recycling channels and promote recycling and reuse of ICT products. Acer’s products embody the concepts of individual producer responsibility (IPR) as we endeavor to reduce our environmental impact to societies, communities and pledge to work with stakeholders like governments, consumers and retailers to undertake responsibility for the recycling and management of e-waste. The European Waste Electrical and Electronic Equipment (WEEE) Directive entered into force on 13th August 2005, and its recast Directive 2012/19/EU transposes into member state’s law, regulations, and administrative provision since 14th February 2014. The Directive focuses on the precautionary prevention of the impact of waste electrical and electronic equipment (WEEE), and in addition, the reuse, recycling and other forms of recovery of such wastes so as to raise the ratio of resource regeneration and to abate the environmental damage by such waste products. Furthermore, responsibilities for the environmental improvement are given to the operators involved in the life cycle of electrical and electronic equipment, e.g. producers, distributors, consumers and operators for WEEE treatment, as to improve environmental performance. Based on the extended producers’ responsibilities for recycling and compliance with the EU’s WEEE Directive and each nation’s regulations, Acer has initiated the planning for recycling of waste products and has joined the local recycling systems in European countries. Therefore, for customers who wish to declare any IT products unserviceable, we advise them to contact qualified local recyclers to ensure proper waste treatment. Member States shall encourage the designer and producer to provide electrical and electronic equipments of easy disassemble and recycling. In this context, Member States shall take appropriate measures so that producers do not prevent, through specific design features or manufacturing processes, WEEE from being reused, unless such specific design features or manufacturing processes present overriding advantages, for example, with regard to the protection of the environment and/or safety requirements. Acer supports the concept of environmentally friendly sustainability and believes that this will place “easily recyclable design considerations” as an important feedback mechanism directly reflected in product design. Acer continues to work toward easy-disassemble product designs. Cathode ray tubes: The fluorescent coating has to be removed. Equipment containing gases that are ozone depleting or have a global warming potential (GWP) above 15: the gases must be properly extracted and properly treated. Ozone-depleting gases must be treated in accordance with Regulation (EC) No 2037/2000 of the European Parliament and of the Council of 29 June 2000 on substances that deplete the ozone layer. Gas discharge lamps: The mercury shall be removed. Valuable metals presence in electrical and electronic products, such as copper and gold presence in PCB plates, and a few electrical and electronic components necessarily disposed by special manners (as shown in WEEE Annex VII), could be worthy resources when properly separated or environmentally hazardous materials when disposed improperly. (For example, the combustion of PCB plates might produce toxic dioxin and furan.) Therefore, the end-of-life electronic products should not be treated as unsorted electronic waste and should be collected separately and specially for reuse, recycling and other forms of recovery in order to achieve resource sustaining, environmental protection and preservation of human’s health. As WEEE is sent to the collection systems, it will be disassembled to recycle the reusable components and to remove the substances, preparations and components shown in Annex VII. The WEEE will be then pulverized, classified and sorted out to recycle valuable metals (such as iron, copper, aluminum) and plastics for reuse. The unclassified materials can also be regenerated by other forms of recovery to raise their recycling value. The key point of return and collection of WEEE to special recycling systems is the product consumer or user, who is the controller to send WEEE to the right places. Accordingly, if there is any IT product to be discarded, please send it to local qualified recycling system to ensure proper recycling of IT wastes. The WEEE Directive requires producers to mark electrical and electronic equipment put on the market after August 13, 2005 with a 'crossed-out wheeled bin' symbol. This is for reminding consumers not to dispose of WEEE as unsorted municipal waste and to collect such WEEE separately. Please check local regulations for disposal of electronic products. In order to facilitate reuse and collection of WEEE, including maintenance, upgrade, refurbishment and recycling, Acer following the WEEE Directive will provide reuse and treatment information for each type of new EEE within one year after the equipment is put on the market. Acer reaches out to shoulder the manufacturers’ product recycling responsibilities. Acer complies with the EU’s WEEE Directive and each nation’s laws requiring participation in recycling systems, as well as planning for recycling of waste products. The following information concerning resource recycling information in Taiwan, Europe, U.S. & Canada, Japan and India is compiled below for consumers’ reference. In Europe, we have planned our products and components recycling schemes in accordance with EU directives. Components that are recycled separately include the main unit of the product, batteries, secondary batteries, and packaging. By integrating our recycling channels with local systems we guarantee our customers that their Acer product will be properly disposed of. Our battery recycling program, for example, covers 3 aspects. First, we do not use mercury, cadmium, lead, or similar hazardous substances. Second, the design of our products ensures that batteries are easily identifiable and detachable. Third, clearly indicating the position of the battery and its type in the product disassembly guide facilitates the easy removal of the battery and its proper recycling. As for packaging, we have endeavored to make it as lightweight as possible to save resources, and restricted the use of heavy metals materials in manufacture. The packaging is also stamped with a recycling symbol and logo of the materials it is composed of. See our recycling channels at Recycling Channel Contact Information for European Nations. As for used battery recycling, Acer is a member of the Rechargeable Battery Recycling Corporation (RBRC). Should consumers have any unserviceable notebook computer batteries, call the consumer service hotline at 1-877-723-1297 or email to customerservice@call2recycle.org for further information. Based on the pollution prevention principle, Acer avoids using hazardous materials from design phase of a product such as mercury, cadmium and lead. Therefore, all Acer products comply with the requirement of the Battery Directive. In product recycling phase, batteries on the list of Annex VII of WEEE are required to be treated separately. Due to Acer’s Individual Producer Responsibility concept, the product parts listed in the Annex VII shall be designed in a way as easy-to-identify and easy-to-disassemble and shall be described in Disassembly Instructions for their locations and types. The waste batteries are thus can be easily and safely removed and recycled. Batteries contain liquid, acid and metals. The landfill of these materials together with municipal waste will leach out waste liquid, acid and heavy metals to pollute the soil and groundwater, or lead to further poisoning of the human body. The incineration of them will also have heavy metal contamination in the air or in the ashes. The secondary pollution will reach also to the soil and the groundwater. If batteries are recycled properly, the valuable resource can be reused again and the impact of the hazardous materials can also be minimized. Therefore, the waste batteries and accumulators shall not be placed in landfill or incinerated. Instead, they shall be collected and treated separately from municipal waste to professional recycling facilities in order to reserve resources and to protect human health and the environment. The batteries into the recycling facilities will be then be disassembled, pulverized, classified and sorted out to recycle valuable metals (such as lithium, zinc, manganese, nickel, cobalt and iron). The unclassified materials can also be regenerated by other forms of recovery to raise their recycling value. But the key point of return and collection of waste batteries to professional recycling facilities is the product consumer, who is the controller to send batteries to the right places. To comply with the EU’s Battery Directive and each nation’s regulations, Acer has initiated the planning for recycling of waste batteries and has joined the local recycling systems in European countries. Batteries for discarding should be sent to the local franchisee or qualified recycling system to ensure proper recycling of waste batteries. Please see Recycling Channel Contact Information for European Nations. The symbol indicating ‘separate collection’ for all batteries and accumulators shall be the crossed-out wheeled bin shown below. It is to remind consumers not to dispose waste batteries and accumulators together with municipal waste. All batteries, accumulators or bottom cells that contain mercury more than 0.0005%, cadmium more than 0.002% or lead more than 0.004% shall be labeled with the chemical symbols of the heavy metals (Hg, Cd, or Pb) under the crossed-out wheeled bin symbols.